Last night I tried a new recipe. It sounds a bit weird, but was actually pretty tasty! I had it again tonight and I would argue that it was almost better as leftovers than as the original dish! My one alteration I would make is to add a little bit more cream cheese and sour cream – the dish has a little kick to it, but felt a little dry. Enjoy! Preheat oven to 350 degrees. In a large pot, bring water to boil and cook egg noodles according to package instructions.In the meantime, in a very large skillet, brown your ground beef then drain the fat. Then add the chili powder, cumin, and cayenne pepper. Stir to combine. Add in the cream cheese until melted and combined. In a large bowl, combine sour cream, enchilada sauce, half the cheddar cheese, half the monterey jack cheese, corn kernels, and diced green chiles. Stir to combine. Pour mixture over the beef and let simmer for 2-3 minutes. In the meantime, drain your pasta. 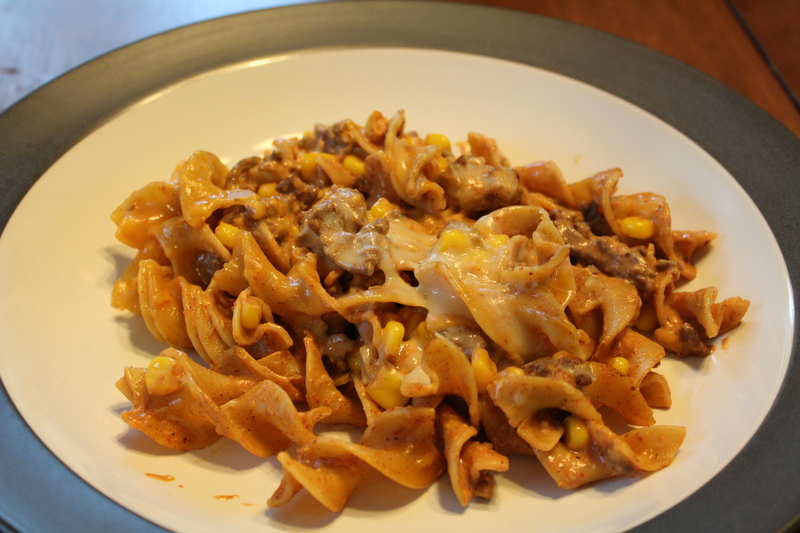 After you’ve drained it, add the pasta to the beef mixture. Make sure everything is coated in the sauce. In a large casserole dish, pour in the pasta mixture and top with the remaining cheese.Bake for 15 minutes or until cheese has completely melted.